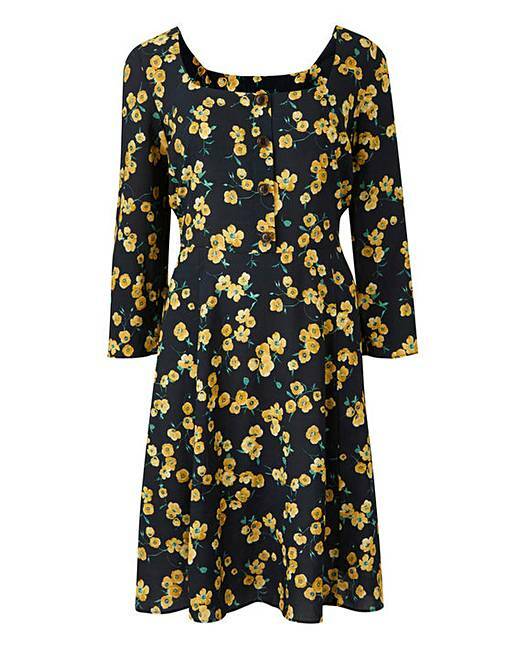 Yellow Floral Square Neck Tea Dress is rated 2.2 out of 5 by 13. The perfect addition to your SS19 is here, the Square-Neck Tea Dress. 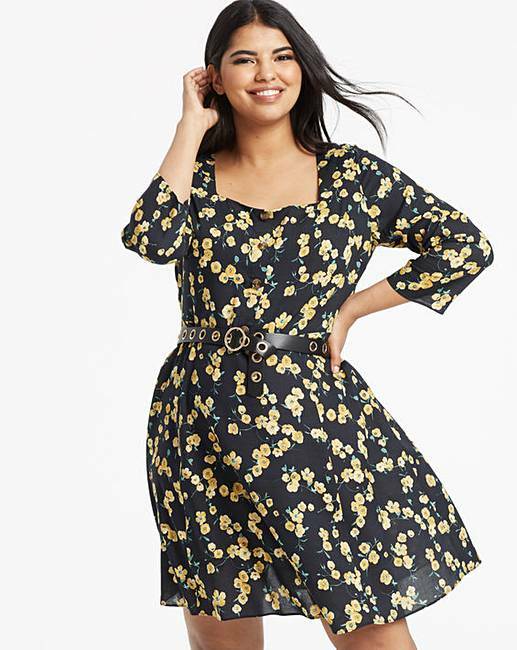 Pretty and bold, this feminine tea dress is adorned in a gorgeous black and yellow floral print. Featuring a square neck, short sleeves and cut to a figure-flattering skater shape, this dress is made from a lightweight material that drapes beautifully along those curves. Transformable from casual daytime looks to dressing up for an evening look, this versatile tea dress is sure to be a wardrobe favourite this season. Rated 2 out of 5 by CCWH from Strange fit I bought this dress for birthday drinks, and I should have listened to the reviews! It’s far too big around the shoulders and the bust. I’m quite short so not sure if that’s why it sat funny on me? Also very low cut on bust and the material felt cheap. Had to return. Rated 3 out of 5 by Ash7 from Terrible fit on the neck I loved the print on the dress and the shape)style but the square neck was very wide and loose fitting which spoiled it for me. Rated 1 out of 5 by Daisy from Huge on the Shoulders and Bust Very disappointed huge on the shoulders and bust did not fit properly at all. Ordered a size 18 and the neckline was very low cut and wide could see my bra straps. Rated 3 out of 5 by Jani B from Bad fit I loved the look and fabric of this dress but the neck was far too low. The neck line was that low that all of my bra was showing. Rated 5 out of 5 by MeganA95 from Stunning This is probably the most flattering dress I’ve ever worn. Good length, knee length but enough to cover my (large) bum. My 40 DD cups were covered just enough and the fit skins over my tummy. Bought at size 18. Love this. Rated 5 out of 5 by Emma from Lovely dress! I bought this for a night out with friends. Really comfortable and easy to wear. I wore it with ankle boots and denim jacket. I was reluctant to try this due to previous reviews so bought 2 different dresses to try. I sent the other one back and kept this. I didn't have the same problem with the top and I have a C cup chest so not huge to fill it out!! It didn't gapeat all. Disappointed it didn't come with the belt as shown in the picture though.